Western blot analysis of cell extracts from the cells or media from mouse bone marrow derived macrophages (mBMDM), untreated (-) or treated with Lipopolysaccharides (LPS) #14011 (50 ng/ml, 4 hr) followed by Nigericin (15 μM, 45 min) (+), using Cleaved Caspase-1 (Asp296) (E2G2I) Rabbit mAb (upper), or Caspase-1 (E2Z1C) Rabbit mAb (lower). Western blot of A20, EL4, and M1 cell lines using Cleaved Caspase-1 (Asp296) (E2G2I) Rabbit mAb (upper), Caspase-1 (E2Z1C) Rabbit mAb (middle), or β-Actin (D6A8) Rabbit mAb #8457 (lower). 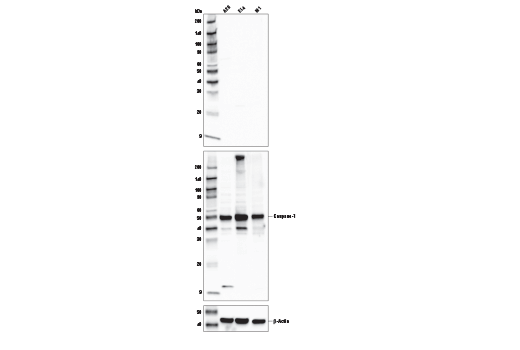 The lack of staining in these cell lines using Cleaved Caspase-1 (Asp296) (E2G2I) Rabbit mAb demonstrates that it does not cross-react with full-length caspase-1. Immunoprecipitation of Cleaved Caspase-1 (Asp296) from extracts of acetone precipitated media from mouse bone marrow derived macrophages treated with Lipopolysaccharides (LPS) #14011 (50ng/ml, 4hr) followed by Nigericin (15 μM, 45 min). Lane 1 is 10% input, lane 2 is Rabbit (DA1E) mAb IgG XP® Isotype Control #3900, and lane 3 is Cleaved Caspase-1 (Asp296) (E2G2I) Rabbit mAb. 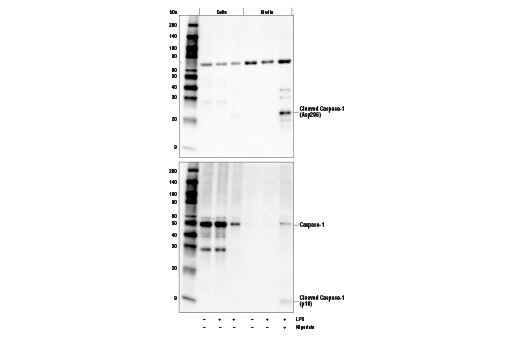 Western blot analysis was performed using Cleaved Caspase-1 (Asp296) (E2G2I) Rabbit mAb. 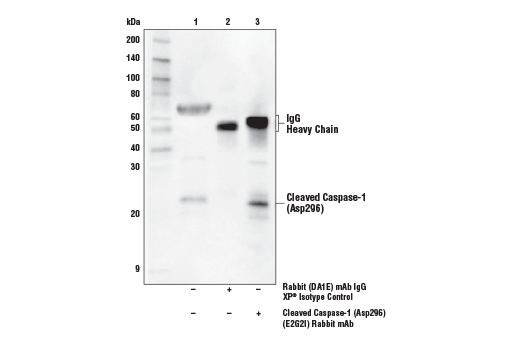 Anti-rabbit IgG, HRP-linked Antibody #7074 was used as a secondary antibody. Cleaved Caspase-1 (Asp296) (E2G2I) Rabbit mAb recognizes endogenous levels of caspase-1 protein only when cleaved at Asp296. A non-specific band is detected at 70 kDa in some cells. Monoclonal antibody is produced by immunizing animals with a synthetic peptide corresponding to residues surrounding Asp296 of mouse caspase-1 protein. Caspase-1, or interleukin-1ß converting enzyme (ICE/ICEα), is a class I cysteine protease, which also includes caspases -4, -5, -11, and -12. Caspase-1 cleaves inflammatory cytokines such as pro-IL-1ß and interferon-γ inducing factor (IL-18) into their mature forms (1,2). Like other caspases, caspase-1 is proteolytically activated from a proenzyme to produce a tetramer of its two active subunits, p20 and p10. Caspase-1 has a large amino-terminal pro-domain that contains a caspase recruitment domain (CARD). Overexpression of caspase-1 can induce apoptosis (3). Mice deficient in caspase-1, however, have no overt defects in apoptosis but do have defects in the maturation of pro-IL-1β and are resistant to endotoxic shock (4,5). At least six caspase-1 isoforms have been identified, including caspase-1 α, β, γ, δ, ε and ζ (6). Most caspase-1 isoforms (α, β, γ and δ) produce products between 30-48 kDa and induce apoptosis upon over-expression. Caspase-1 ε typically contains only the p10 subunit, does not induce apoptosis and may act as a dominant negative. The widely expressed ζ isoform of caspase-1 induces apoptosis and lacks 39 amino-terminal residues found in the α isoform (6). Activation of caspase-1 occurs through an oligomerization molecular platform designated the "inflammasome" that includes caspase-5, Pycard/Asc, and NALP1 (7). Martinon, F. and Tschopp, J. (2004) Cell 117, 561-74. Miura, M. et al. (1993) Cell 75, 653-60. Kuida, K. et al. (1995) Science 267, 2000-3. Li, P. et al. (1995) Cell 80, 401-11. Feng, Q. et al. (2004) Genomics 84, 587-91. Martinon, F. et al. (2002) Mol Cell 10, 417-26.